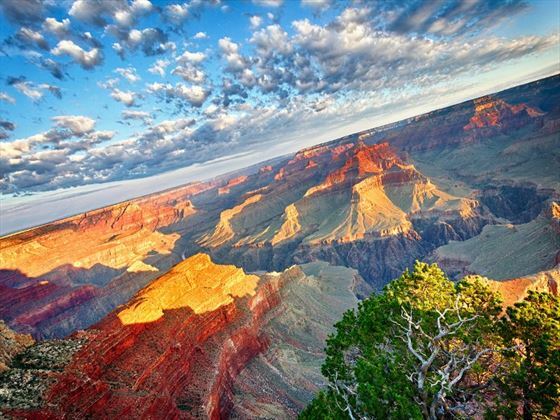 America’s national parks are renowned for being some of the best in the world and are brimming with extraordinary landscapes, wildlife and impressive vistas. 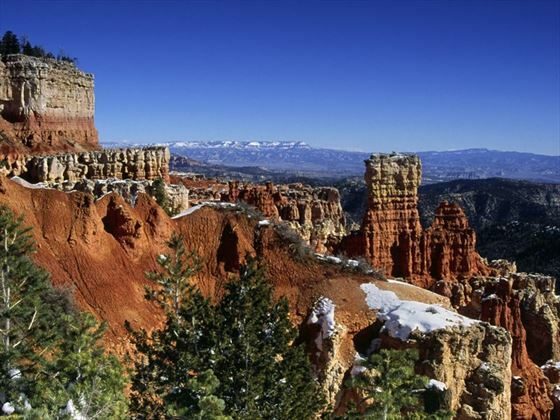 This 15-day tour takes you on an exciting journey through some of the best-loved parks, including Zion, Bryce Canyon, Yellowstone, Arches, Canyonlands and the iconic Grand Canyon. Along with your fellow travellers and an expert guide, you’ll have the chance to immerse yourself in the natural beauty that these parks have to offer for an unforgettable experience. Arrive into Las Vegas and check in at your hotel – afterwards, there’s some free time to make the most of the awe-inspiring sights, shops and slot machines, or to take a dip in the hotel’s pool. 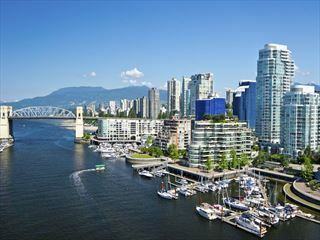 In the evening, you’ll meet with your tour guide and fellow travellers with a welcome reception. 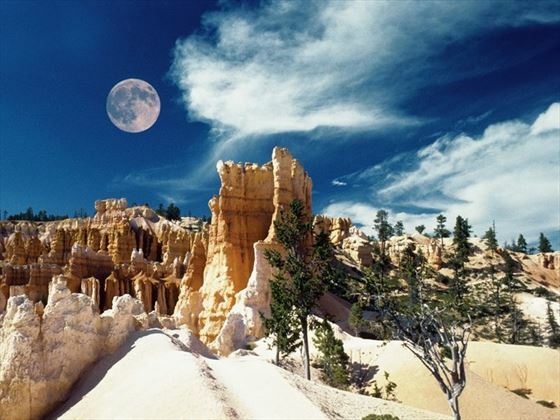 Leave Las Vegas in the morning and head for the towering cliffs and canyons of Zion National Park, before journeying onwards to the famous Bryce Canyon National Park – this area has the largest concentration of hoodoos which are tall limestone spires. Cross the Oregon Trail into Wyoming where you’ll stop in Montpelier at the Oregon Trail Centre. You’ll have the opportunity to enjoy the interactive exhibits and explore the challenges of the Old Trail. You’ll have time to have lunch before departing for the beauty of Jackson – the evening will be free for you to explore this picturesque area. There will be an early start today to take part in an optional guided raft trip in search of the amazing wildlife on the Snake River (seasonal). 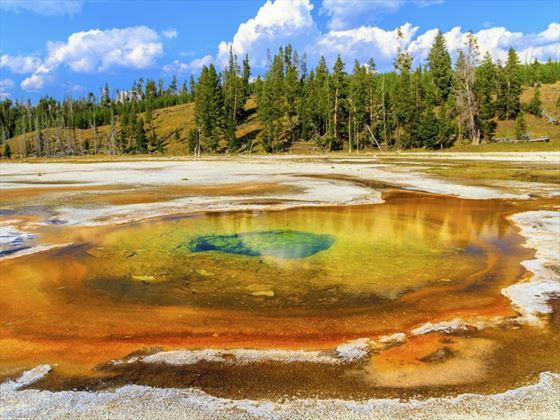 From here you can then traverse the Grand Teton National Park on your way to the world-famous Yellowstone Park – first established in 1872, this renowned area became the world’s first national park. You’ll be joined by a local expert who will show you the amazing hot springs, geysers and mud pools that this park is well known for*. 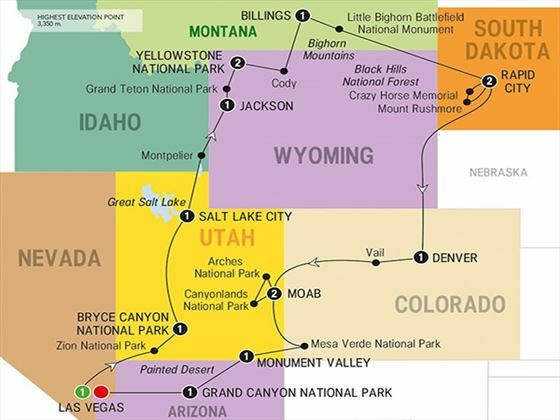 *If the south entrance is closed due to weather conditions, the route will change and travel west from Jackson via Idaho to enter Yellowstone Park through the west entrance. Today is a free day to make the most of your time at Yellowstone, with its impressive waterfalls and inspiring wildlife. Head to Old Faithful and watch as it shoots water over 100ft into the air before relaxing in the evening with a spot of stargazing. Journey north to Cody today, which is named for its most famous native son, Buffalo Bill, to dive into the history of the area with a local expert at theBuffalo Bill Centre of the West. From here, make your way to Big Sky Country for a unique and memorable dinner filled with classic Western hospitality and local dishes. Visit Little Bighorn this morning which is the infamous battlefield that saw Custer lead his men into battle with a battalion of Sioux and Cheyenne warriors. Immerse yourself in the history and then travel east through the Black Hills to Rapid City. 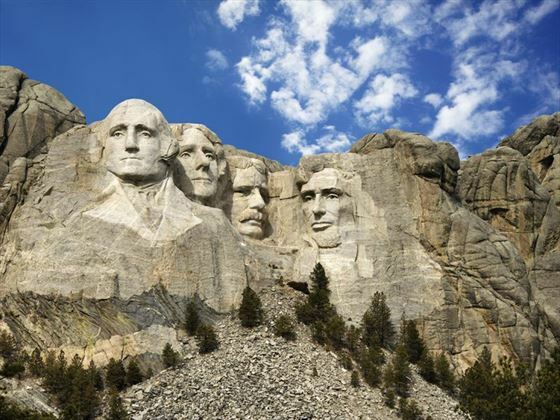 Explore the stunning natural beauty of the Black Hills today with a drive through the landscape to visit Mount Rushmore and the Crazy Horse Memorial, which is a mountain carving of the famous war chief of the Lakota people. In the afternoon you will return to Rapid City to enjoy a group dinner in the evening. In the morning, cross some of the most beautiful scenery in the west in Wyoming’s expansive grasslands as you head for Denver. The evening is free to enjoy the sights at leisure so why not seek out some of the great restaurants in the area? Venture into the mountains today to ascend the foothills of the Rockies and cross the Continental Divide to Vail. This charming alpine village was founded in 1966 and has a wonderful old-school feel that attracts outdoor enthusiasts. From here, make your way to Moab where you’ll spot the settings for many of John Ford’s 1940s movies. The evening is yours to enjoy as you please, from admiring the sunset over the red cliffs to enjoying an exhilarating boat ride along the Colorado River with dinner included. 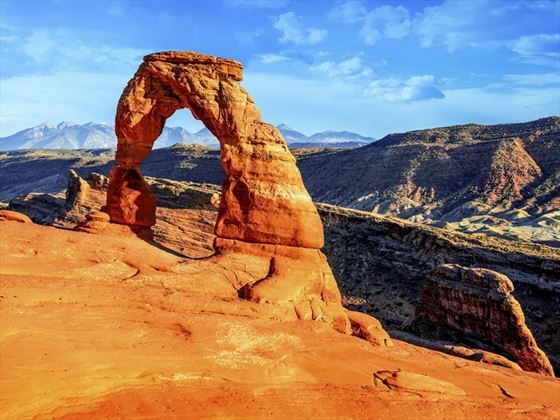 Embark on a journey to two exciting and beautiful national parks today – the Canyonlands National Park and the breath-taking Arches National Park where thousands of natural sandstone arches have been carved from thousands of years’ worth of wind and rain. In the evening, enjoy some free time to relax and unwind. Today you will visit the Mesa Verde National Park, a UNESCO World Heritage Site and the ancient community of the Ancestral Puebloan people who lived here between 600 and 1300 AD. You’ll have the opportunity to explore the cliff-top buildings and the enormous Cliff House which is the largest cliff dwelling in the world. In the evening, there will be a classic Navajo cookout served at Monument Valley before you’ll be transferred back to your hotel. 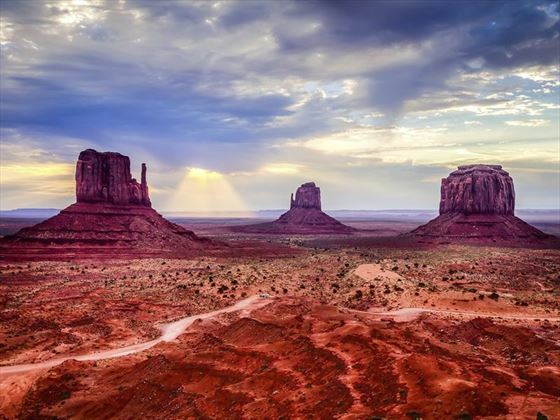 Spend the morning admiring the beauty of Monument Valley in open-air vehicles to make the most of this amazing destination, accompanied by a guide. Visit the land of the Navajo people and stop off at the historic Cameron Trading Post. 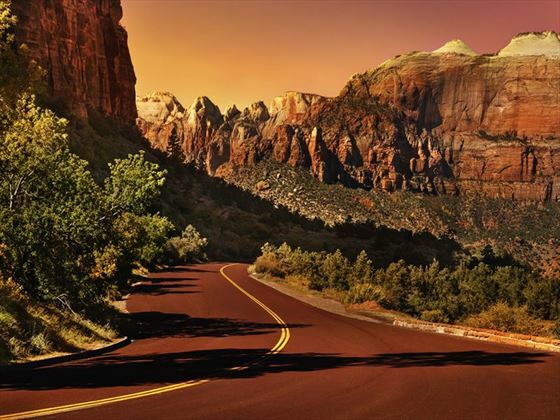 Enjoy the stunning views along the Desert View Drive which hint at the incredible vistas ahead – those of the Grand Canyon. You’ll meet with a local expert who will educate you on the incredibly geology that has created the canyon over the past 1.7 billion years. In the evening, take part in a farewell dinner with your group. There’s an optional excursion this morning to take part in a helicopter or fixed-wing aircraft flight over the canyon before hitting the road again, stopping en-route in Seligman and Kingman which are Route 66 hotspots that have kept the culture of this renowned route alive. 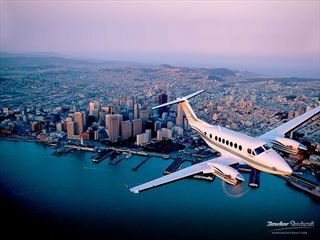 You’ll end your journey in Las Vegas where there will be a transfer to take you to the airport for your departing flight. Daily flights available with United Airlines, American Airlines, KLM, Delta Airlines, British Airways, Virgin Atlantic and US Airways. Early Booking Offer Book and pay for your 2019 tour by 30 Apr '19 and save up to €320pp Discounts included in advertised prices.